Four more economic development projects championed by the Far North District Council’s commercial trading and asset management arm, Far North Holdings, are to receive $6.724 million of government funding from the Provincial Growth Fund (PGF) launched by the Minister of Regional Economic Development, Shane Jones, last month. These projects will be financed through a range of funding streams which Far North Holdings has been either fully or partly responsible for arranging. The PGF is only one investment avenue. “The four announcements made by the government today provide the funding needed to maintain and upgrade key items of infrastructure that underpin our district’s tourism industry and the wider economy. We are continuing to work with government officials to complete the business cases to ensure government has all the right information before contracting,” said Far North Holdings chief executive Andy Nock. “After State Highway One the airport is this district’s most significant transport lifeline, vital for business travel, tourism and the wellbeing of our communities. Mr Nock met with Minister of Regional Economic Development Shane Jones in Kerikeri in January to explain how all the projects work in unison to boost economic development right across the district. “We’re extremely happy with this result and keen to push ahead with government, local communities and business owners to bring all these projects to fruition so that they can start delivering benefits for the people of our district,” Mr Nock said. The funding will enable the inclusion of a baggage screening area to future-proof the new terminal against requirements for such a facility by CAA. This work is expected to be complete in December this year, in time for the peak traveller season, but this does depend largely on contractor availability. Paihia Wharf is one of New Zealand’s busiest, in terms of passenger traffic, after those in Auckland’s Viaduct. The upgrade funded by the PGF will enable Far North Holdings to widen the main wharf walkway which is currently heavily congested three times a day. This will result in a much more open and pleasant experience, allowing the public to better enjoy the wharf. This work is expected to be complete by the end of the year. A high res version of this image is available on request. Paihia Wharf is one of the busiest in New Zealand. 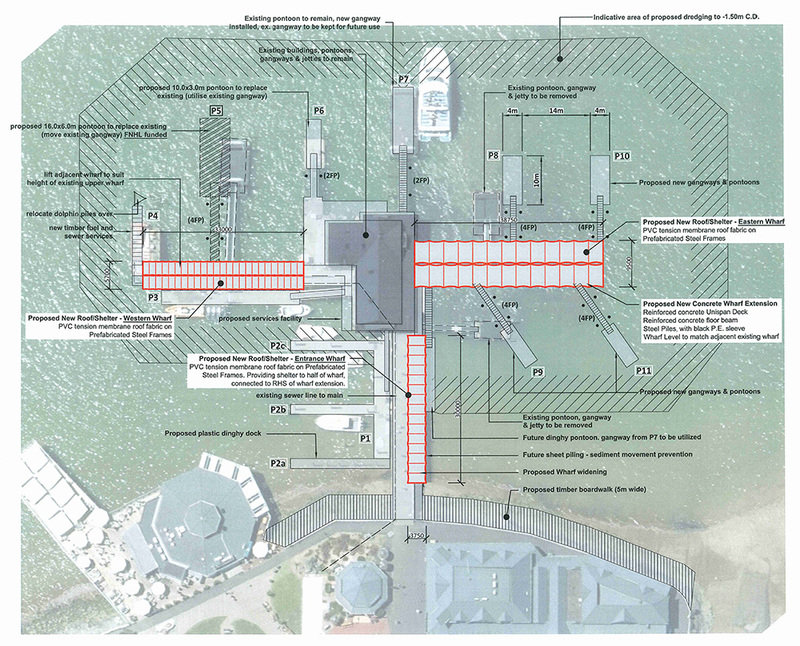 Development plans unveiled today by Far North Holdings include widening the main walkway, a public dinghy dock, four new berths and a sewage pump to encourage vessel masters to pump out holding tanks there instead of at sea. Plans for Russell Wharf developed by Far North Holdings, the Russell Waterfront Trust and wharf tenants include replacing low tidal landings and the fixed timber landing jetty, a new dinghy dock, a wharf extension and a sewage and water service across the fuel pontoon. The upgrade to Russell Wharf has been designed in consultation with, and with the full knowledge and oversight of, existing tenants and the Russell community in the form of the Russell Waterfront Trust. It includes replacing low tidal landings with floating concrete pontoons, removing the fixed timber landing jetty and replacing it with a concrete pontoon, a new dinghy dock, a wharf extension to the west for more visitor space and improved passenger flow, and a sewage and water service across the fuel pontoon. The sewage service will not be available for charter operators based in Paihia, where pump-out facilities are also being made available as part of today’s funding announcements. The PGF grant does not include the $900,000 already being invested by Far North Holdings and the Far North District Council in replacing the main commercial pontoon which recently failed (~$430,000), and re-developing the information centre and café building (~$470,000). The PGF grant will only be awarded once this investment has been made. “Along with the new and improved facilities at the marina we hope that the pontoon will become another drawcard that enables the local community to make better use of, and get improved enjoyment from, the Opua waterfront,” Mr Nock said. The facility would also be a significant step forward in Far North Holdings’ strategy of developing the port into one of the South Pacific’s leading marine service hubs, Mr Nock said. This would generate additional and long-lasting employment, wealth creation opportunity and social benefit. The pontoon will also enable the Bay of Islands to host and service superyachts to an extent that is simply not possible today. It forecasts an injection of $436m into the New Zealand economy from superyacht owners, staff and guests during the Cup period. The new concrete pontoon will be 120 metres long and four metres wide. 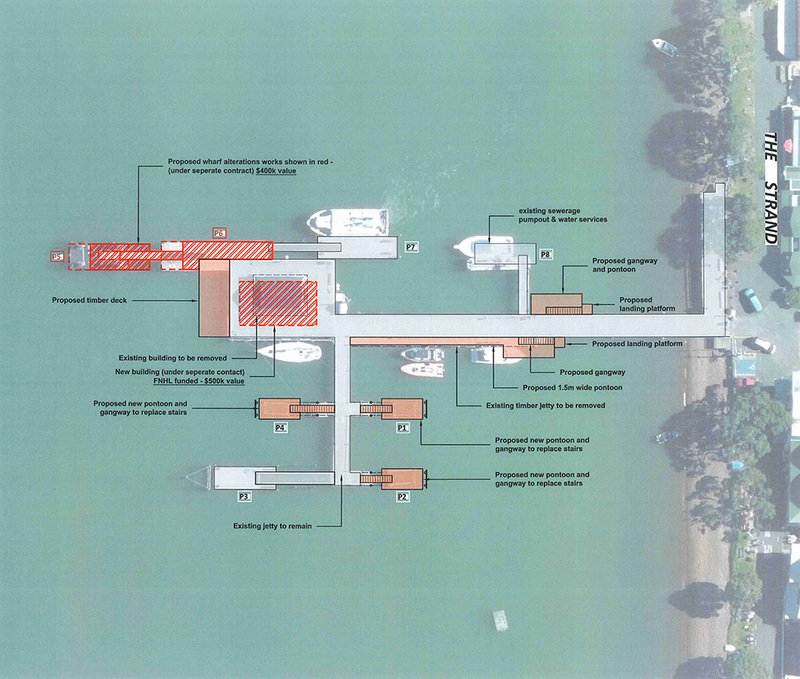 It will sit to the eastern side of Opua Wharf and will extend out as far northwards as the existing boardwalk on the western side. Work is expected to be complete by the end of the year, subject to contractor availability and the programming of construction at Paihia and Russell wharves which will be the priority. Mr Nock said it was “wonderful” to see meaningful, consultation-led regional investment and thanked the Minister and government officials for the confidence they have demonstrated in the district’s potential. “For many years now there has been a lot of talk about how to address the economic imbalance in the regions, which included the Far North, and it is great to see this being addressed by government. And, more importantly, followed up on so quickly in a direct attempt to counter this imbalance,” he said. In addition to managing Far North infrastructure on behalf of ratepayers, Far North Holdings promotes investment and employment across the district. It uses its assets and expertise to help local businesses and communities identify commercial potential and make the most of opportunities that come their way. Its focus is on maximising the economic potential of the Far North, for the benefit of all ratepayers. For more than a decade 50 percent of FNHL’s trading surplus has been distributed to the Far North District Council or reinvested in property and infrastructure. Without this income general rates across the District would have been about four percent higher each year.